Well, sorry, no great adventures, just normal tourist stuff to report. 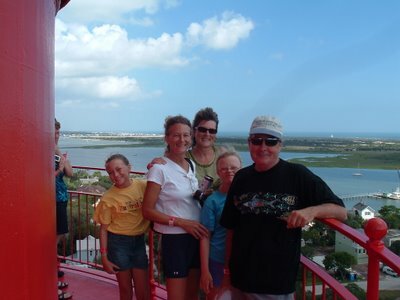 Kathy’s sister Kari and her family Kami and Mike were here in St. Augustine over the weekend. We toured the fort (built in the late 1500's! ), shopped in the old part of town where they had old tourist souvenirs, got pummeled in the rough Atlantic, and climbed the lighthouse. Mom and Dad are here now, staying in a motel overlooking our anchorage. Dad and I worked on the windless, which was successful (for the time being). Kathy and Rachel had a history lesson in town in the oldest schoolhouse in America. Pretty cool. Mom toured the old section of town with them and then sat in on the lesson which was religions of the Middle East. Not the same as when I went to school. Dad and I plan on visiting the Hunter factory tomorrow. It’s in Alachua, about an hour from here. That should give me some good insight into how our boat was built, and what’s in all those hidden spaces I can’t get to.